I know I mentioned that I recently got a felting machine. I got it just a couple days before Mother's Day. I embellished 3 pairs of shorts with my new machine. 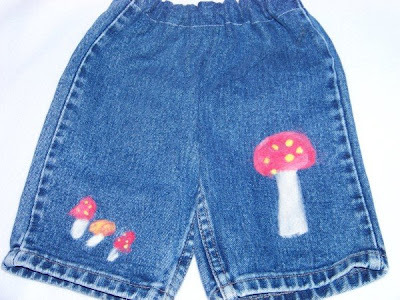 Shorts are made from my old jeans. I know you must get tired of hearing made from old jeans over and over. The good news for you (bad for me) is I am running out of jeans. I will have to start using my fabrics soon (I might even use some of the beautiful Japanese fabrics I got for Christmas). 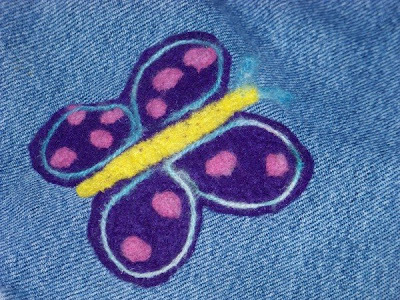 Are you wondering how I have been sewing with an old stash of jeans for 3+ years now without running out? My large collection of jeans came from my hubby moving up in size 2 or3 times, add to that my HUGE collection of thin clothes (before I became a mom), and jeans given to me to make things with (thanks to my Mom, Dad, and MIL). My own large collection of old (thin) jeans have been tucked in a cubby in the back of my closet out of the way for years. I now need that space to store my new sewing machines (my family is getting tired of having 4 machines on the kitchen table all at the same time). I figured the best thing to do is to embroider one day, sew one day, serge the edges another, and embellish (use the felting machine) another day. That system I hope will keep the fabric and supplies tucked away and I will only need to move one machine at meal times. In the next week I hope to move whatever machine I am using out on my porch to use when my children are playing in the yard. When that happens my kitchen table should be free of my messes. 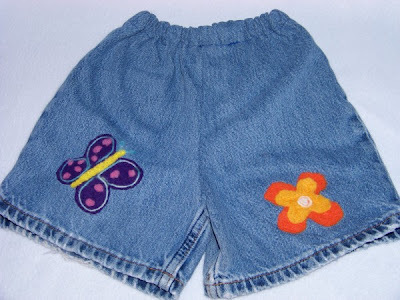 The first shorts I decorated with craft felt that I cut into a flower and a butterfly. Close up of flower all the edges of the flower curl up a bit and look cute. The butterfly I did add a bit of hand dyed superwash merino to outline the wings. I made them for Demi but Zee claimed them. She hugs them and yells for them when she sees them. The day Demi tried them on Zee screamed and yelled for them and even tried pulling them off of Demi. LOL! I decided it was best to give them to Zee because she likes them so much and Demi didn't care that much for them. They are longer shorts on Zee but she is happy with them so we are all happy. My favorite shorts are this pair. I used some yellow and white cotton dishcloth yarn to decorate them. I added quilt strips to the bottom. Notice this pair of shorts are not made from the bottom of jeans. 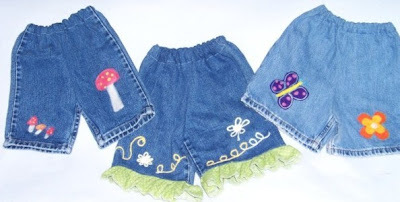 I can get 2 pairs of jeans (size 18months-4 T) out of one pair of jeans. 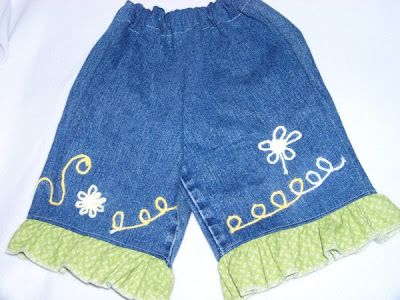 When my children are babies (newborn-12 months) I can get 3 pairs of shorts from one pair of jeans. I used my new gathering foot for my overlock machine (my family gave me for Mother's Day) to add the ruffles. I am not crazy about the gathering foot (seems to be more fiddly and takes longer than the clear elastic method that I normaly use). I hope in time it will grow on me. After looking at some clothes in the stores with the stitching showing I decided to leave the serging at the bottom show. 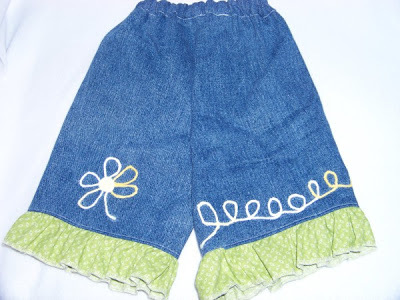 I view them all as play clothes that will be worn playing in the sand box and at the park. they are made from old clothes. Because of that I didn't take the time to turn under the stitching to hem it under. They are my favorite out of the three. They fit Demi as long shorts and Zee as gauchos (wide leg crop pants). All I did was swirl some yarn and tack it down with the felter. Quick, easy, and fun! The last pair of shorts are Demi's favorite. She insisted on wearing them the first 3 days after I made them. They never get put away it is right from the clean clothes basket to her body. I think she might even like them more than her dresses. I made them from some merino roving I dyed. I love how needle felting dyed roving gives the look of water colored painting (I think that is what it is called). Here is a close up of the big mushroom. and a closeup of the baby mushrooms. Sorry I didn't take any pictures of the children wearing them. I am glad I remembered to snap a picture at all. I am sure I will have lots of pictures of my girls wearing them by the end of summer. I am sure everyone will be sick of seeing them. 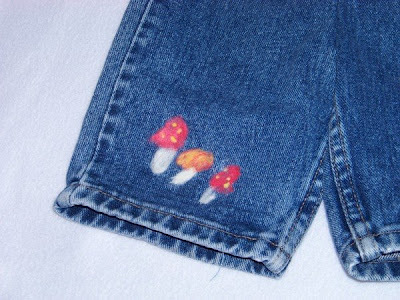 If you don't have a felting machine but like any of the shorts and might want to make something similar let me say you can easily do this without buying a felting machine. 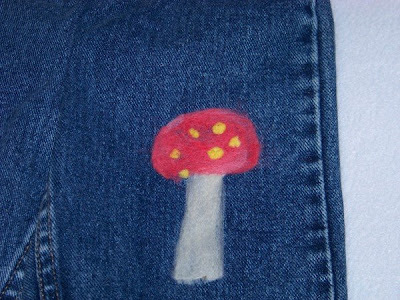 Needle felting can be very cheap. Felting needles run $5-6 at Joanns for a pack of 4 needles. I started needle felting with a 4 piece assortment pack from Joanns. When I first started out I bought the assortment pack and the felting foam (that was about $3 or $4). The foam is not needed you can use any old thick pillow or foam. The reason for the felting foam is to give you something to stab the needles into. As long as the foam or pillow is thick or firm enough you will be fine (make sure the needles don't poke out the back side). I get a lot more than $5 of fun out of a pack of needles! 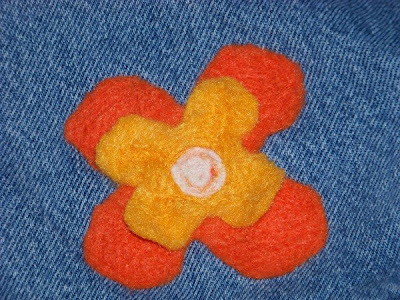 I have seen some online kids craft projects that they say children can use felting needles. My son is 9 and I worry a bit that he might stab himself with the sharp needles so I let him use my felting machine (after I set the guard) and I plan to get him a clover felting tool. The stand alone needles I think are a bit more dangerous to use (for my 9 year old son who often gets distracted with what he is doing). I have poked myself with a felting needle many times and it does hurt. Of course I have poked myself with sewing needles a lot more than felting needles. You can buy a clover felting tool that is a bit easier to use than the needles alone for a little bit more money. Joann's sells them for about $16.50 and you can buy needles to replace the ones in the tool when they bend or break. This place has excellent prices on felting supplies http://www.tryourdesigns.com/index1.htm The person who owns it I think is the list mom for the machine felting group. Her prices for hand felting needles and machine felting needles are a lot cheaper than any other place I have seen. When I need new needles for my machine or to use by hand I will be trying this place out. If you live near me (NE PA) and ever want to give felting a try stop by and we can make a day of it! I am in a bit of a rush I hope this post makes sense. I don't have any time to look it over. It is Sunday and my family is waiting for me to join them. I will be back in a day or two (I hope). Gift For My Mom and My New Toys.